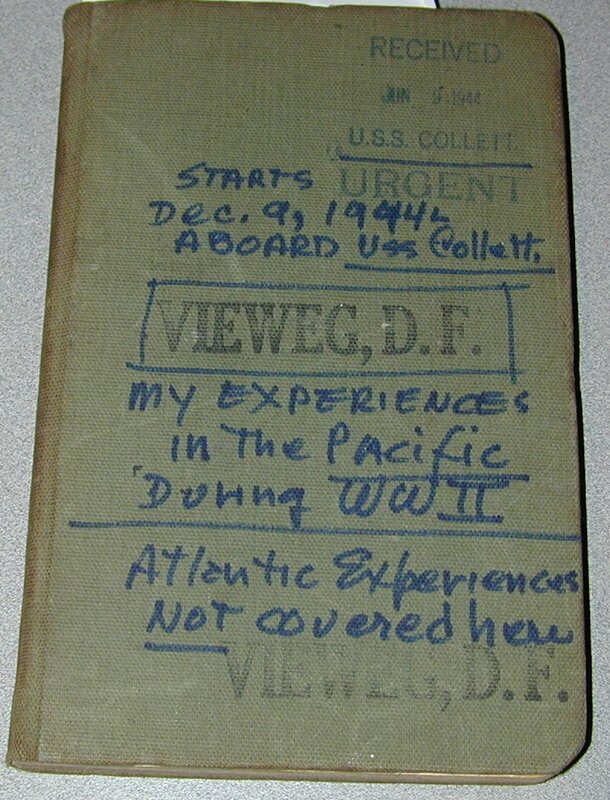 From Don Vieweg's Son Don Vieweg, Jr.
My father was present as part of the crew at the commissioning of the Collett at the Boston Navy Yard on May 16th, 1944. He was a Radioman 3rd Class. The commissioning event is not covered in this journal. 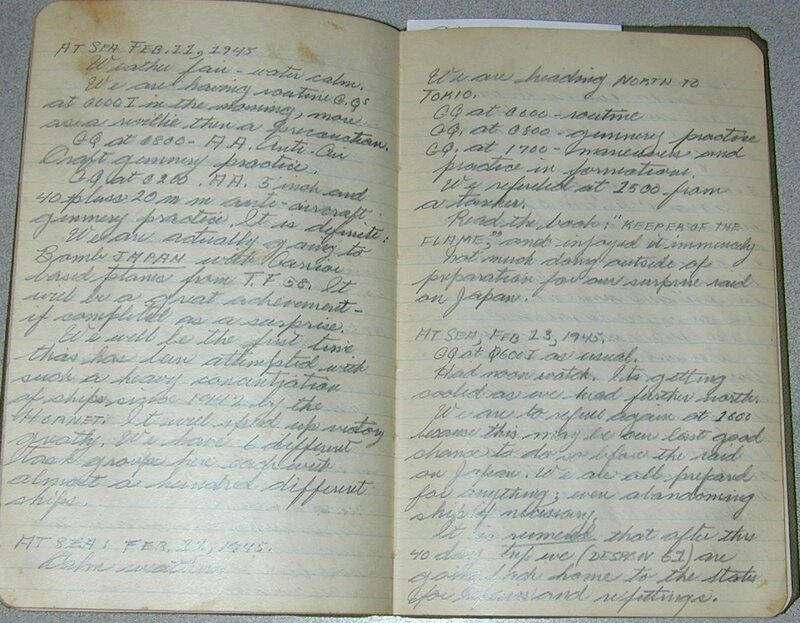 This journal picks up starting December 9, 1944, while the ship was in the Pacific. In Port Ulithi, in the Caroline Islands. We received 27 bags of mail. Received letters from Dottie (at that time his girlfriend, then his wife of 63 years) and family members. Received a box consisting of a jar of jam, a checkers game, a package of dehydrated chicken soup and an attractive card. Must thank them. Had no watch. In Luzon area, put out to sea early. Assigned to new and largest task force, TF 382. The water was rough and we were pounded with occasional squalls. We are going to bomb Luzon in the Philippine Islands. I had morning watch. Not much Morse code business due to radio interference. Wrote to Dottie and mom. I believe we are to be out for some weeks. Had little sleep. Read book, “Stories of Sake” and magazines. Choppy waves. GQ at 1000 for strafing runs and another at 1300 for aircraft target practice. Had late watch. Out for two days already. Getting bored. Ship started a library in sick bay. Good idea. Weather calm except for rain occasionally. I hope mom or Dottie sends me some good books. Reading material is very scarce here. Had usual morning GQ at 0520 and morning watch. Not much Morse code business. Did twelve chin-ups for a bet. Won a dollar. Also won $5.00 from Garrison for a call bet. Refueled at sea from BB Wisconsin at 0800. Received movie also. Saw “The Thief of Bagdad” movie in mess hall at 1430 and enjoyed it very much. Morning GQ at 0530. Had early watch. Weather fair with intermittent squalls. Crapped out at 1100 and was aroused by PA system. Plane crashed. No survivors, 1400. Plane and pilot lost. We searched for half hour. Evening GQ at 1800. Planes are bombarding Guam? and Tamara all day. Expect action tonight and tomorrow. Picket Duty Tonight. Picket duty is a ship (usually a can) designated to go ahead of a task force usually from five to twenty miles to keep alert for any enemy patrols. We sent out many planes from our carriers against Japanese occupied Luzon. We expect action soon unless the Japs are caught unawares. Weather fair. Ship rolling due to low fuel. Had early watch. Crapped out at 0945 only to be aroused by “Plane Crash” over the P.A. System. Later I learned that two planes had crashed and we rescued three of our boys. The planes were returning from their raids on Luzon P.I. More planes were sent out to bomb Luzon. 1000 – Two more of our planes crashed near us. Our boys were killed, all but one that we picked up. His raft was afloat but he did not have the strength to climb into it so he floated in the water. The water around him was colored pea green from a chemical designed to make him to be seen from the sky. He was a young man, 24 or so, and his first words after being rescued were “I had a hell of a place for a swim.” I quite agree with him. His head was damaged, required 8 stitches. The aircraft carrier Hancock gave us a hearty congratulations for picking up her lost birds. She rewarded us with 40 gallons of ice cream for picking up four men. Old Collett is right on the ball. Two Japanese Bettys and four rescued boys to her credit. Morning watch – nothing much. Still bombing Luzon. Planes going and returning from their missions over Luzon. Our newscasts reported that carrier-based aircraft had hit and destroyed Japanese harbor installations, shipping and aircraft on (Ciabo??) and Luzon. The weather was fair with the ocean capped with ripples. Today is a day of terrible weather. The sea is furious and the wind sharp. It is a day of rolling, tossing, and sea sickness. We refueled today from the Wisconsin. Our men were drenched and one suffered a broken arm from the operation. Another wrenched his knee and many were bruised when the refueling line broke from the tension put upon it. We will have to refuel again as we did not complete fueling. We received some movies but I doubt whether they will be shown in the mess hall. It’s too rough. Have the late watch. I am thinking of writing a guest editorial for the Cranston Herald. Today is a day that shall live forever in some of our minds. The storm developed into a full hurricane and released her full fury all morning and afternoon. We were low on fuel but all the other ships in the task force were lower. A U.S. ship is not supposed to allow her fuel to go below 50%. We were 65% full and we were the fullest. Other fuel ratings are 10%, 6%, 15%, 30%, 20%. The Collett with 65% is the best suited for towing in case of necessity. The storm grew all day – rain, wind up to 65 and 70 miles per hour raging. The Collett had her gun casing on the port side smashed in from the weight of the swells. Our deck split a gash of three feet starboard side by the forward stack and port side by the aft stack. It was a terrible day with trouble and seasickness. Storm hit us at 1530. TBS [Talk Between Ships] reports some of our carriers are dead without fuel or power of locomotion. Men and planes were lost from the Lexington and the Houston. Many things smashed. We roll 30 to 40 degrees list and all compartments drew water from the vent fans. It’s still hot as hell down here below decks. Only 6 days till Christmas. My third away from home and second to be spent at sea. Not much doing today. Storm subsided and it sure is mighty hot this December. This morning the carriers launched planes as a search party for 10 men lost yesterday. No man could live in that storm. They probably won’t even find the life jackets or the bodies. Our split seams are being repaired and so are the 40MM gun casings on the starboard side. A few ships were lost in the storm. We are hunting for them. Refueled from a tanker at 13:30. I saw Lt. Cooper, the acting educational officer, and filled out an application for a correspondence school course in English for preparation for college after the war. To hell with a promotion. I don’t want any. Too much has to be done just to get to RM2. Weather is fair. Rolling quite a bit though. Not much doing today. I had 4-8 watch. 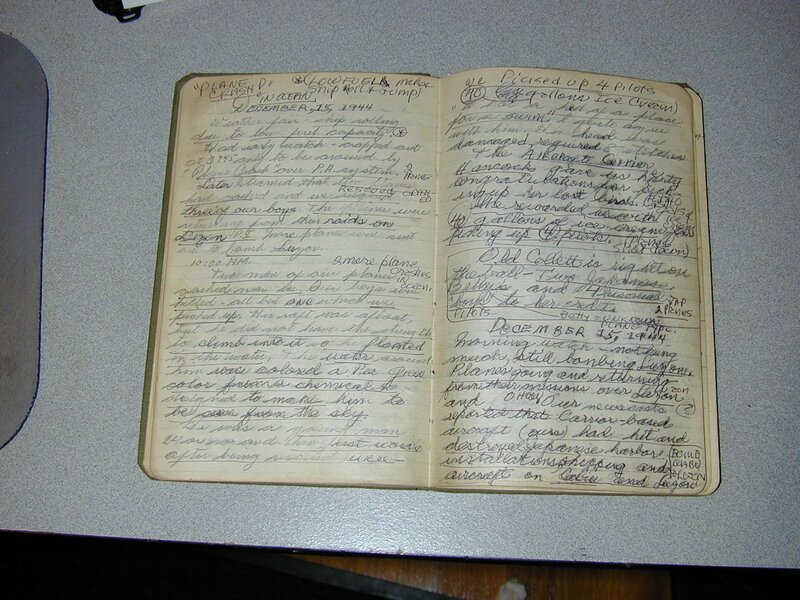 Jotted off a quick letter home but I doubt very much that it will be mailed before 1945. I borrowed an advanced English book from Lt. Cooper. I am now preparing for my college education and hope to go to Harvard University [he ended up at Brown]. TBS [Talk Between Ships, a short-range radio communications] reported 10 survivors we lost 2 days ago were rescued. We’re still searching and it is still as hot as hell. Something is cooking, I can feel it. Weather is fair with intermittent rain squalls. Got early 4-8 watch. 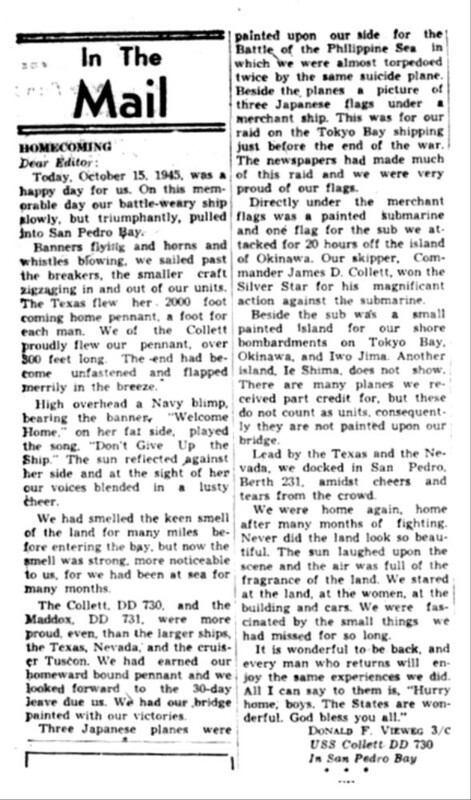 Planes from the carrier LEXINGTON were supposed to be launched for early morning bombing of Luzon and Cebu in the Philippine Islands but the orders were cancelled. Watched movies shown in mess hall. We picked up a heavy 10 foot life raft, all battered and dilapidated to hell. If that raft could talk she would tell an interesting story of death. It was faded, waterlogged, and broken in pieces. The storm must have had tremendous power to perform such a feat. Refueled at 11:00. No mail yet. Hope we get some soon. 13:30 Movie “Sahara” shown in mess hall. Enjoyed it very much. The ventilation was fouled up so we were as hot and as thirsty as the men in the picture. 16:00 Mail came from tanker. Received three letters, one with many letters from family members. I learn to love Dottie more. She is wonderful. Got GQ [General Quarters]. We fired at a floating mine to try and explode it. No explosion. A 20mm shell from the aft starboard side hit the spare barrel. 5 men hurt from shrapnel. I was knocked out. Those responsible may receive a general court martial. Weather fair, calm. Intermittent rain squalls. Early watch. 02:00 GQ. Those fellows that were wounded yesterday were hospitalized. There were 10 all together but five were pretty bad. One was operated on as a sliver of shrapnel was lodged in his stomach. Others got hit in the neck, back, arms, feet, side, and even on the behind. The shells from the 20mm exploded when they hit the spare barrel. Someone will get hell surely. It’s hot today. We are going to Ulithi tomorrow. That little beer can island of the Carolinas sure will look good even if we dock at sea or at a tender. I haven’t made a liberty for 8 months tomorrow. At least this Christmas will be spent in port, with Christmas packages also. We are approaching Ulithi at this very moment. We are screening the heavens. The battleships, carriers, cruisers and AA cruisers [Anti-Aircraft cruisers] are entering the mine fields first. We are guarding for subs until they pass. On December 8 a sub got through the nets and sunk a transport and damaged others. There were 600 dead. We hunted for the bodies. The sub was sunk but we paid quite a cost in lives. We received 24 bags of Christmas packages and two bags of mail. I received many letters from numerous friends. It was a fairly happy Christmas Eve. I opened my packages. Two came from Mom, from June & folks, one from Billy Parenteau and some from Misses Barbara and Ruthie. I received a Keen razor from Dad, and much candy, of which most of it was no good. I received a few goods from the nurses, among them the book “This is Our War” by Ernie Pyle. It’s damned good reading. It’s hot as hell this Christmas Day and much work has to be completed. Billy, Dot’s brother, sent me a package and a yo-yo was enclosed. The fellows are having more fun from playing with it and I am not. 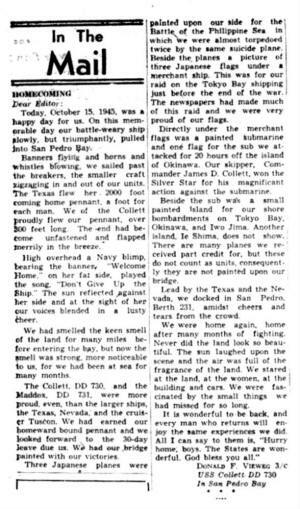 In port at Ulithi, Carolina Islands. Work, sweat, and movies. In port. Nothing doing. No watches. Movies at 19:00. In port. Weather fair. Calm sea. Pulled away from tender at 08:00 to tie up to a buoy in harbor. Fair calm and cool. 06:30 headed to sea with a new task force, 38.7. We have 2 CVSs, 2 CVIs, 2BBs (USS MASSACHUSETTS and USS NEW JERSEY), 20 DDs, with the carrier LEXINGTON. We are preparing for action again. We are designated as a fire-fighting ship. Much scuttlebutt around. Studied English after my watch. 17:50 late watch. I’ve often wondered where authors and poets get the idea about the silver moon. Last night I found out. The moon, on the last night of the old year was full and bright as the sun. It was a golden yellow surrounded by a beautiful silver-red sky. The reflection made me lonely for Dottie. I could almost visualize us together – watching that moon as the old year burned out and the New Year was torched aflame. It was beautiful.